At Weir Valves & Controls UK, we are regularly contacted by new and existing customers who are looking for a method of reducing regular valve failures � many of which would ideally like to avoid the expense and down-time associated with replacing the complete valve assembly. Control valves in particular are traditionally quite a complicated solution, by their very nature they are subjected to high pressure drops, which could, if not properly controlled cause damage to the valve. It is for this very reason our engineering experts have developed the control valve X-Stream� trim. The X-Stream� is a multi-stage trim for severe service applications and is proven to solve problem applications such as cavitation, erosion and noise. The reaction to this solution being made available to the market has been overwhelming � our teams are seeing increased numbers of end-users specifying the X-Stream� trim in new valves when dealing with difficult processes. But what about existing installations? In processes where existing valves are in place, our customers wanted a solution to upgrade their valve trims with an X-Stream� trim solution. By retrofitting a new trim, into an existing valve the customer can eliminate the cost of replacing the complete valve pressure envelope which ultimately reduces the time needed to install a new trim. One such valve issue was discovered at the Umm Al Nar power plant in the Middle East where the existing Minimum Flow Control Valves suffered from regular trim failures due to erosion caused by high pressure drops. The end user consequently had a high spares turnover due to regular trim replacements. This customer�s application had a number of difficulties and our team invested the time and effort in fully understanding the customer�s issues. Fully understanding the application and the process conditions is the first step in providing a suitable trim solution. 1. High Pressure Drop � on liquid service, valves can result in high levels of erosion if not adequately controlled by the valve trim. 2. Cavitation � based on the valve outlet pressure of 4.6 Bar A, and the vapour pressure of 4.574 Bar A, the valve, with a conventional trim would be subjected to high levels of cavitation. The valve trim needed to be specified with multiple stages of pressure reduction to eliminate cavitation. 3. Flashing � based on an outlet pressure of 2.1 Bar A, and a vapour pressure of 4.574 Bar A, the valve process conditions meant that the fluid is flashing. Flashing cannot be prevented and can be highly destructive. The X-Stream� was identified as an ideal solution given that it is designed to gradually reduce the pressure over multiple stages of pressure reduction to minimise the effects of pressure drop. Also, controlling the fluid velocity by using an X-Stream� trim helps to reduce the effect of fluid impingement which ultimately causes erosion across the valve trim. After our analysis, our team then worked closely with the customer to obtain one of the existing valve assemblies for a short period. 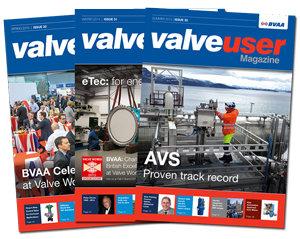 Where valve teams in the UK and Dubai worked together to dismantle the valve and used 3D laser scanning technology to accurately capture the component data and produce 3D CAD models of the valve components. Once the original valve was fully modelled this allowed the team to produce a complete set of detail drawings for a new trim. The cage section of the X-Stream� trim was produced by state of the art Selective Laser Melting (SLM) technology where steel components can be printed directly from a 3D model. Printing the X-Stream� trim meant that high technology aerofoils could be introduced into the trim design which allows a smoother transition of the flow from the inlet to the outlet of the trim. Further, the trim was designed with a replaceable cartridge, where the X-Stream� trim section could easily be unbolted and replaced as a unit, rather than the customer having to replace the whole cage. Once the full replacement trim was fully produced and once the existing valve became available on site, the valve was then was completely stripped, the existing trim removed and the replacement X-Stream� trim fitted. We�re delighted to say that the complete valve was re-built without any issues experienced and fully pressure tested before installation. The customer is now benefitting from the increased performance offered by the X-Stream � multi-stage trim without any valve replacement costs incurred.